Gustav Schwab was the son of a professor. He studied Philology, Philosophy and Theology at Tübingen. He became friends with Ludwig Uhland and Karl Varnhagen, with whom he published a volume of poetry titled "Deutscher Dichterwald". In 1813 he travelled to the North and met Goethe, Schleiermacher, De la Motte Fouqué and de Chamisso. He became a teacher in Stuttgart in 1818. From 1833 onwards he published the literary magazine "Deutschen Muselalmanch" together with De Chamisso. In 1837 he became a pastor in Gomaringen and in 1841 he went back to Stuttgart, where he in 1845 he became a general director of the schools in Württemberg. Schwab was a member of the Schwäbischen Dichterbund, a circle of poets around Justinus Kerner and Ludwig Uhland. 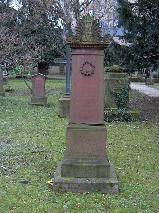 The grave of Gustav Schwab at the Hoppenlau Friedhof, Stuttgart.